U-M welcomes external collaborators! One of the best features about having a U-M Box account is the ability to invite anyone to collaborate. They don't have to be on campus or even have an existing Box account of their own. Use the following practices to get the best experience for collaborating with those outside of U-M.
Get a Box account and share your account information with your U-M organizer. You are ahead of the game if you already have a Box account. If you do not have a Box account, get one for free. 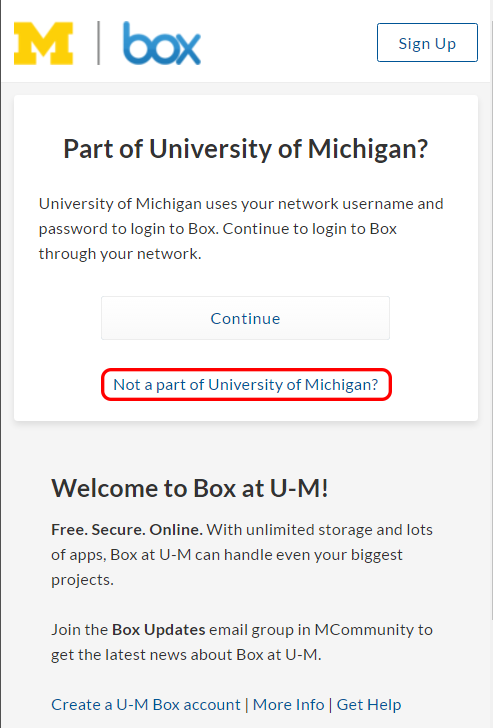 If you are using a personal Box Lite account you may need to click not part of the University of Michigan before logging in. When you receive an invitation to collaborate, follow the link in the email to access the shared folder. Your invitation to collaborate will come from Box. If your invitation to collaborate was sent to an email address affiliated with your existing Box account, you will find the shared folder in that account. If the invitation was sent to an email address NOT affiliated with an existing Box account, you will be prompted to create one. Only create a new Box account if you do not have an existing account. Otherwise, ask the U-M organizer to re-send the invitation to the email address affiliated with your existing Box account. The color of the shard folder will be grey and the Enterprise Owner will be University of Michigan. The content in a shared folder impacts the quota of the folder owner only, not collaborators' quotas. Other Box limits, such as maximum file size, are dictated by the rules of the folder owner's Box account. For example, if someone from U-M invites a user of a free personal Box account into a collaboration folder, the maximum file size for all content uploaded to that folder will be 15 GB. If the free account holder owned the folder, the maximum file size would be 250 MB, the limit for free accounts. Tip: For easiest access, ask your collaborators to set up their Box account before you invite them. Send your collaborators a link to this document so that they know what to expect and how to work with your U-M Box content. Once you are collaborating in Box, working together is no different from working with people at U-M. Content in the shared account folder is subject to the features of U-M Box, so even users with free personal accounts will have the advantages of larger quotas and file size, as well as other features enjoyed by U-M Box accounts. Collaboration in U-M Box can be done at the file or folder level. When inviting external users to collaborate on a folder, use the email address your collaborators used to set up their Box accounts. All shared link access settings allow collaborators in the folder access. Therefore, if you create a shared link accessible by People in your company, your external collaborators will have access via this link, even though they are not U-M Box users. If an external user is not a collaborator on the folder, they will not be able to access the content. Important: Do not store sensitive data in folders outside of U-M Box unless you have verified the account owner's security assurances.